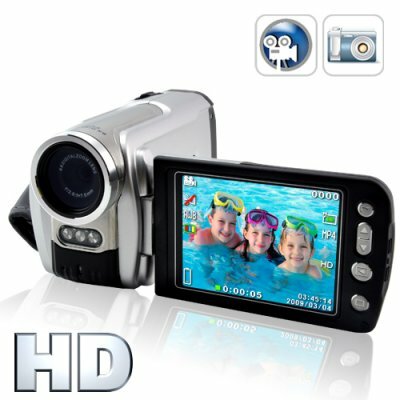 Successfully Added HD Camcorder - High Definition Digital Video Camera (Silver) to your Shopping Cart. If you are buying this for your next family trip, the high megapixel camera resolution will make all the scenery shots dazzling to behold, while also giving you the ability to shoot high megapixel still images (5MP native sensor, 12MP thru interpolation). Having a high capacity SD card slot (up to 16GB) and Li-ion battery, you will have plenty of capacity to store all your favorite moments, while at the same time being able to easily hot swap memory cards and batteries as the day goes on. A super low priced way to make your own pro style movies and videos at a family friendly budget price, in stock and available for individual or stock orders now. From the leader in direct from China electronics, Chinavasion. The kit includes everything you need to get started - camera, battery, charger, USB and AV cable. All that you need to provide is an SD card and your enthusiasm! Features a 3 inch flip out LCD view screen and up to 1280x720 video resolution. Budget Friendly HD Camcorder. The DV camera for the average guy.